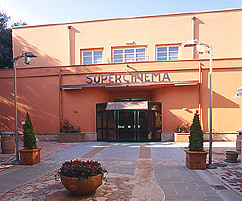 The Multiplex Supercinema of Foligno is the oldest cinemas in the city, built in 1936 was named Cinema Impero and decorated with beautiful frescoes Carlo Frappi art-deco, still well preserved. In 2003 it underwent a major refurbishment with the creation of up to 3 tiers with midnight blue velvet seats, equipped with modern devices, while leaving unchanged the integrity and historical value of the structure. The hotel has bars, stairs and lift to ensure full accessibility to the disabled.